I’m featuring this card because of two techniques: Sakura Glaze pens and lining up Slice cutouts on one piece of paper. 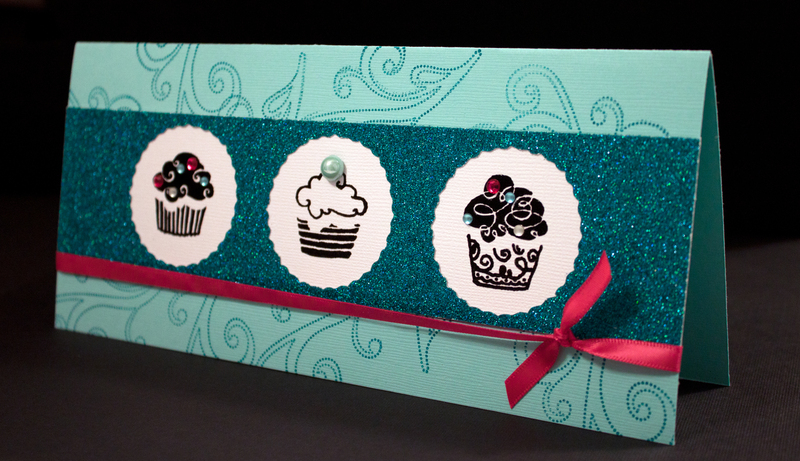 I used a black Glaze pen on the cupcakes stamped on white cardstock. Glaze pens offer a slightly raised, shiny appearance and are an alternative to embossing powders. When I stamped the images in black, they weren’t vivid enough, particularly because I used textured cardstock. This is the first time I’ve tried to line up cuts with the Slice. I saw a video on this and wanted to test it out. My first cut didn’t go well — it went off the paper. My second try was successful. To mark on the glitter paper, I used a white Sakura Gelly Roll pen, which makes the markings clearly visible. To cover up the markings, I used a brush pen in a color close to the color of the glitter paper. If you don’t own a Slice, you could use a 2-inch punch. This entry was posted in Birthdays and tagged birthday, cupcakes, Making Memories Slice. Bookmark the permalink.